This powerful and handy program allows you to replace the standard folder icon for individual folders with any eye-catching icon you wish, chosen from hundreds of built-in colorful icons or generated automatically by internal IconConverter depending on the content of a folder (music, video, images, etc.). Moreover, Lovely Folders can change folder background! Your individual folders now may have a background image - just like your desktop. Lovely Folders 4.3 is a shareware program and can be used as a demo to try the software until the free trial period has ended. A full version of the program is available after the trial period ends. 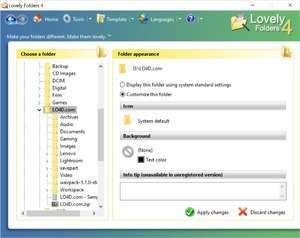 For security reasons, you should also check out the Lovely Folders download at LO4D.com which includes virus and malware tests. Additional screenshots of this application download may be available, too.